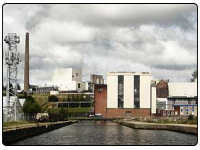 Port Dundas Scotch Whisky distillery opened in 1813 and is situated in Port Dundas in the Lowlands of Scotland in Glasgow. The distillery was badly damaged by fire in 1903. Port Dundas chimney cover the North West skyline (as you can see in the photo) and can be seen all over Glasgow. When the wind blows in your direction you can smell the distillery in action. Over the years this distillery has produced grain whisky and also contributor to famous blends such as Haig, Johnnie Walker and White Horse. The distillery future in under doubt now and could be closed in the next couple of years.